The Roughneck Clothing trouser pack is designed to meet everyday needs, with multiple pockets to suit the majority of trades. 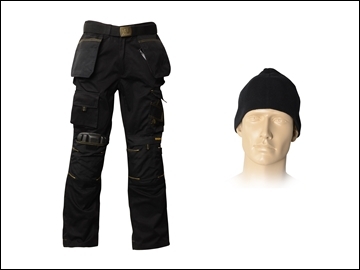 Comes supplied with: trousers, belt, Beanie hat and kneepads. Roughneck Holster trousers are made from 280gsm Polyester Cotton twill, with Cordura reinforcement on the knee pad pockets, back of the trouser hem and holster pockets. Cordura is a hard wearing fabric designed to withstand every day use. The trousers have a reinforced crutch and YKK zip and zip pull for easy operation. Two Hook and Loop rear pockets. A multi left leg side pocket with Hook and Loop pocket. Right leg pocket with Hook and Loop flap. 32in leg length on all waist sizes. The Roughneck Black Woven Belt is a One Size Fits All (Up to 46 inch waist) belt. It is made from 100% Polyester and has a nickel Buckle with the Roughneck logo. The Roughneck Kneepads are made from 100% Polyethylene with an ergonomic shape for comfort and flexibility. They are the perfect fit for the Roughneck Holster trousers and can be used with other similar work trousers.